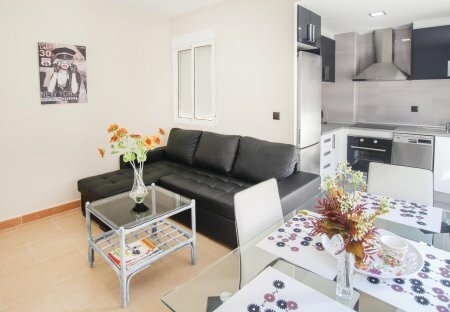 Located in the center of Alicante, you will find this tasteful 3-room holiday apartment. By bus or tram you can visit the fabulous city. The Market Hall, the Santa Barbara Castle. Cozy holiday apartment in Albufera near Alicante, just 200 meters from the beautiful sandy beach. This 1 bedroom apartment with swimming pool is located in Alicante and sleeps 3 people. It has WiFi, air conditioning and a garden. The apartment is within walking distance of a beach. This 4 bedroom apartment with swimming pool is located in Alicante and sleeps 7 people. It has air conditioning, a garden and parking nearby. The apartment is near a beach. This bright and cozy apartment is located less than 150 meters from the beach of Albufereta de Alicante and is ideal for a small family or friends. This quiet holiday apartment in the center of Alicante is located on the 4th floor without lift and is 1 km from the beach. The apartment consists of 2 bedrooms, a cozy living room. Beautiful and elegant holiday apartment in the centre of Alicante (Costa Blanca), only 800 m from the beach of San Gabriel and 10 minutes from the airport. It has 4 spacious bedrooms. This cozy and quiet 3-bedroom penthouse holiday apartment with air conditioning in all bedrooms and a beautiful large terrace overlooking the city and the castle is located on the 8th floor and is. This beautiful and well-maintained house is the ideal choice for an unforgettable holiday! Here you can enjoy nature to the fullest and enjoy various outdoor activities such as hiking. 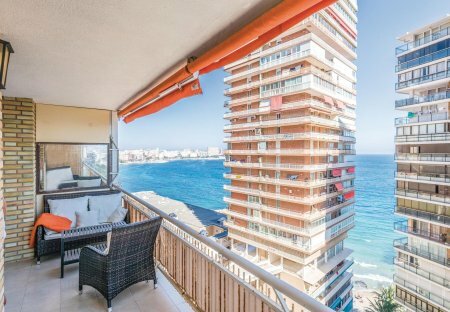 Have a beautiful view of Alicante in the direction of the sea, from the third and top floor of the apartment, which is accessible by lift. Alicante holiday apartment sleeps 4 in Alicante, Costa Blanca, Spain. Sandy beach across the street. Quiet gated residence with gardens, 1st floor, lift and secure covered parking. Alicante is a port city and the capital of the Costa Blanca, located in the south east, in Alicante Province. As one of the most popular resorts in Spain, it's famous for its nearby beaches, fiestas and cosmopolitan atmosphere; a perfect summer holiday destination for families, singles and couples alike, with plenty to see and do. The city lies at the foot of Santa Barbara Castle, an icon of Alicante, perched on Benacantil mountain next to the harbour. The region is steeped in Phoenician, Greek and Arab history, with traditional Spanish squares dotted all around the region. The old walled town is where you'll find most of the restaurants and nightlife, with atmospheric tapas bars and restaurants offering local and international dishes. Beachgoers are spoiled for choice when it comes to the Costa Blanca, but the main beach Postiguet is where most come to unwind and enjoy the calm waters, water sports and castle views. For culture vultures, the Museum of Contemporary Art in Plaza de Santa Maria is a must-see, housing 20th century works of famous Spanish artists such as Picasso, Miro and Dali. The Grava Museum of Fine Arts in Calla Niagra is also not to be missed, exhibiting sculptures and paintings from local Valencian artists. The palm-lined marina is bustling whatever the time of day, so whether you want an evening stroll along the seafront or dinner with a view, it's the perfect place for watching the world go by as the yachts and fishing boasts gently bob up and down. A flight from the UK to Alicante Airport takes approx. 2.5 hours. August is the hottest month with a high of 31°C. Alicante's climate is predominantly sunny and dry. Alicante is a golfer's paradise. Practice your swing on Alicante Golf, just 5 minutes from the centre of Alicante. Alicante is approx. a 30 minute drive from Benidorm and Elche. Alicante is famous for its celebrations. Don't miss Fogueres de Sant Joan festival in June - the biggest of them all! Alicante city has it all; beaches, a bustling nightlife, atmospheric restaurants, plenty of facilities for families and of course, great weather. Located on Spain's Mediterranean coast, it has a modern marina, lively seafront promenade and an abundance of shops and museums. The old town is dotted with picturesque plazas and for kids, Benidorm's Terramittica theme park is just a 30 minute drive away. Head to El Barrio for some great bars, lively music venues and old village charm. For a day out by the coast, El Positguet, Playa de la Almadraba and San Juan are all excellent golden sand beaches with modern facilities and an abundance of water sports. History buff or not, medieval Santa Barbara Castle standing 166m above sea level is a must-see for its spectacular views over Alicante and the Mediterranean. In the evenings take a stroll down Explanada de Espana promenade just along the modern marina where there is a fine selection of bars and restaurants, together with a lively metropolitan atmosphere. Alicante is also the perfect base to explore the rest of the Costa Blanca, with the fine beaches of Santa Pola just over a 20 minute drive away along the coast and the coves of Tabarca Island offering the perfect snorkeling spot. Why rent a villa or apartment in Alicante with Clickstay? For the last ten years we've sent thousands of happy holidaymakers to villas and apartments all over Alicante! We're a trusted brand with secure online payment and you can book your holiday in Alicante with confidence. We're also here to help – whether you're looking for that perfect rental in Alicante or you're already on holiday, you can call or email our customer services team. Own a holiday villa or apartment in Alicante? If you are an owner or agent with holiday villas or apartments in Alicante, or if you want to increase your rentals, then sign up to Clickstay and manage your properties directly. Clickstay lets owners to contact renters directly. Our online system allows you to manage your property description, prices and availability as well as catering for all sorts of holiday rentals – from villas with private pools to beach front apartments. Our costs are low: we charge a £1, €1 or $1 sign-up fee and you can then advertise an unlimited number of properties to directly to renters looking for an Alicante holiday rental. We charge 10% marketing commission when a renter books your property through the Clickstay site. Interested? Find out more on how you can list your villa or apartment rentals. Calle San Francisco is a pedestrian street with giant mushrooms and snails that will have the little ones feeling like they're in fairytale land! Explanada de Espana promenade is lined by 400 palm trees and paved with 6.6 million red, black and cream marble tiles! Tapas originated in Alicante, when travelers where offered small servings of delicacies to complement their wine or beer. Both Spanish and Valancian are spoken in Alicante.